The 50th British Grand Prix at Silverstone has come to a close but Bill Peters, Caterham Group’s head of IT, is busy at work, preparing to present his IT vision for his F1 team to the new owners. The previous owner of Caterham F1 team, Tony Fernandes, recently sold the company to a Swiss and Middle Eastern consortium. Previously Lotus Racing, the Oxfordshire-based team's name was changed to Caterham in 2012. Peters is a seasoned F1 IT man, with his 17 years of IT experience in the sector – five years at Caterham/Lotus and 12 years with F1 giant McLaren. “I have some great memories from McLaren but big brands tend to get institutionalised and I wanted a new challenge,” Peters says. Having a server virtualisation strategy was crucial to get scalable systems ready in six months and within budget, Peters says. That was ahead of its time in 2009 when most businesses were still operating physical infrastructure and mainframes. “Creating rack space is very expensive in a physical IT environment. With virtualisation, we are able to spin up virtual machines (VMs) in under an hour at less cost,” says a member of Peters’ IT team managing the trackside IT for Caterham at Silverstone. But the innovation did not end there. Peters’ trackside IT is even more revolutionary. It uses an off-the-shelf virtualised infrastructure based on Dell and Intel’s technologies. “We will need five full racks of servers trackside, but with virtualisation, we use just a single dense rack,” he says. “We have to ship this trackside IT every time to the place of the race and air freight costs are up to $250 a kilo, so reducing that has yielded real savings." “When you have huge budgets available, you don’t worry about freight costs and ship racks and racks of physical servers for trackside use,” Peters says. According to him, 75% of the F1 groups still have traditional physical trackside IT. “Even McLaren’s IT was just a hybrid one, mixing physical and virtual IT, when I was with the team," he says. But Peters also has to arrange complete disaster recovery capabilities trackside with his limited budget. “The race must go on. So, we have one off-the-shelf server kit that will ensure our driver, Kamui Kobayashi, and the car are both safe and ready to be on the tracks," he says. The team explains how a couple of years ago, one F1 group had no DR capabilities onsite and had it affected that team's performance at the race. Failure is not an option, Peters says, explaining the importance of trackside DR. But his team has never had to use the DR kit in the last five years. 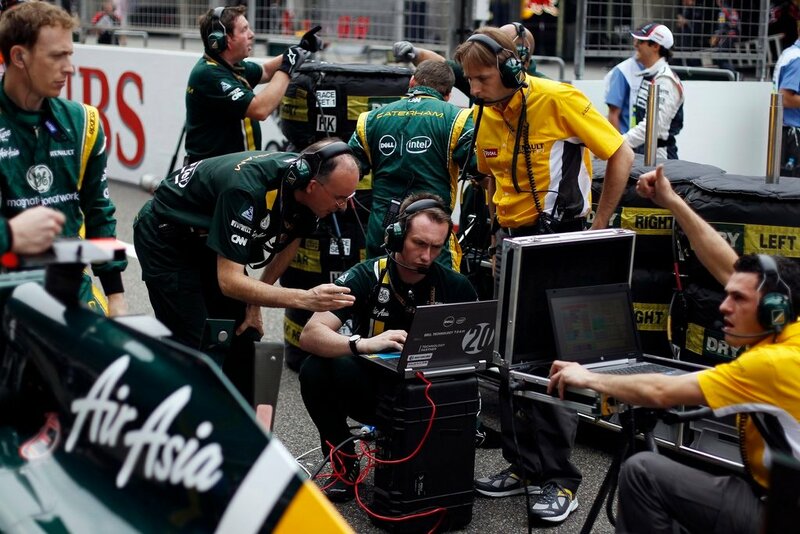 For a modern F1 team, cutting-edge computing infrastructure is critical, insists Peters. And the IT head is responsible to provide Caterham users with high performance computing and supercomputers. “We use Dell HPC [high performance computing] powered by Intel,” Peters says. The supercomputers are mainly used for Computational Fluid Dynamics (CFD) – allowing engineers to test and simulate parts of the car in a virtual environment, rather than doing it in a physical world which is more costly and time-consuming. “Our engineers can try out 100 different combinations at once and the supercomputers perform 10 billion calculations in 12 hours and give the engineer the three or four best combination that will work,” he explains. “The more simulations and iterations we do in the virtual world, the less the driver has to do in the physical world and concentrate more on his strategies to win the race,” he adds. The HPC is also used by the team to do 3D simulations. Backend technology is one of the key elements that help the driver perform better in a race. The IT team collects 50,000 data points from the cars as it moves around the track on practice day and analyse this data to further improve Caterham’s chances at the race. That’s about 30 petaflops of performance the IT team needs from HPC systems. “We have to provide IT systems to some of the smartest professionals – HPC guys, scientists, aero-design engineers, and engine experts,” says Peters. “So we have to be on top of our game to give these users what they want. So, now the F1 season has come to a close, what’s on Peters’ agenda now? “Our work has only just started,” he says. For a start, Peters is considering how to further reduce the single trackside server to half for the next season. “This means, we can ship out some HPC systems to trackside too for further efficiency,” he says. He is also looking to test Dell’s new PowerEdge servers called VRTX – a shared infrastructure platform which comes integrated with server, networking, storage and management capabilities. “I also want to test out Dell’s converged infrastructure systems and ultimately get some of our business intelligence applications on the cloud,” he says as he prepares for an IT meeting with the new management team. “I am hoping for a budget increase,” concludes a hopeful Peters who is a big fan of DIY when he is not getting ready for F1.